If the latest developments in the 132-year-old Congress Party are an indication, a churning process has begun within that could intensify into massive change. Change is the father of new opportunities. Stagnancy of thought and action are harbingers of annihilation. If the latest developments in the 132-year-old Congress Party are an indication, a churning process has begun within that could intensify into massive change. The Grand Old Party, which ruled India for over five decades and controlled two-thirds of the state governments, is on the verge of becoming an extinct political species. With just two and a half states under the Hand’s thumb and fewer than 10 per cent of the Lok Sabha seats, its ideological identity and geographical influence were fading in the twilight of Modi Season. The Congress even lacked a face with pan-Indian credibility and acceptability. More alarming was the near-rejection of the Gandhi tag, which was once the boarding pass for power. The party has been languishing in the desert of banality without even a winning slogan. Though it ruled during the early 1990s and between 2004 and 2014, the GOP hasn’t enjoyed a majority on its own since 1984, when it crossed the 400 MPs mark under Rajiv Gandhi’s leadership. Now, thirty three years later, his son Rahul has embarked on changing the party’s feel, look and posture. His new social media hashtag is #IAMCongress. After 14 years of political internship, has he discovered that time is running out for him and his party? Like it did with every other Gandhi in the past, the buck would stop with him. Indira trounced the Syndicate in 1969 and created a new Congress. Rajiv generated a thunderous tsunami in 1984. Sonia brought the party back to power for a decade in 2004. Can a fourth generation Gandhi haul the GOP out of its turbulent mess in 2019? Ever since he took over as the 17th Congress president after Independence and 87th since the party’s inception in 1885, RaGa has been criss-crossing the country, confabulating with party leaders and opinion makers to fashion a new mass identity from the ashes of a preponderous past. Rahul’s moment came while displaying unexpected oratorical and strategic skills ín the Lok Sabha on July 20 during a no-confidence motion against the Narendra Modi government—the 27th in parliamentary history. Rahul did not come across either as a secularist or a palpitating Pappu. He spoke extempore, without stumbling for the right word, adjective or phrase. In a 40-minute wordathon, he ignored the niceties and conventions of parliamentary debate. His primary target was not the government but the Prime Minister. Satire was Rahul’s veritable weapon against Modi, whom he labelled a ‘bhagidar (partner) and not ‘chowkidar’’ (guard). For the past few months, Rahul Gandhi has been striving to define himself and the role of the Congress in national politics, where the Opposition has been marginalized by Modi’s climactic charisma. In the past, there was Lohia to counter Nehru. Indira Gandhi faced powerful adversaries like Atal Behari Vajpayee, Lal Krishna Advani and Chandrashekar. But Modi doesn’t have a credible Opposition party or leader for a foil. Most politicos on the other side are either tainted or confined to their own regional fiefdoms, looking to the prime minister for crumbs and favours. While Sonia could stitch together a viable non-BJP Alliance in 2004, her son is unable to convince Opposition parties that he is the most acceptable commander to lead the charge next year. It is still left to her to coordinate strategy with allies. Barring Lalu-led Rashtriya Janata Dal, no other anti-BJP organisation has shown faith in the Gandhi scion’s leadership capabilities. Rahul has not held a single one-to-one meeting with any Opposition stalwart; not even with Akhilesh Yadav, his ally during the last UP elections. Congress insiders believe that their chief is setting his own house in order before reaching out to like-minded parties. He has rejigged the organisation by retaining the Old Guard in the all-powerful Congress Working Committee, while at the same time inducting GenNext as special and permanent invitees. His speeches and actions indicate his desire to regain the GOP’s lost constituency of Dalits, the poor, farmers, youth and women. Significantly, Rahul is refraining from the habitually excessive invocation of ‘secularism’ that differentiates the Congress from the BJP. He has cleverly identified the RSS as his main bugbear to retain his Muslim vote bank. It’s for the first time that the Congress is staking its claim on nationalism. For God’s sake and his own, Rahul has resurrected his grandmother’s practice of visiting temples and Hindu shrines. Clearly, the RaGa Congress is bereft of dubious dogmas and ineffective ideologies. Rahul is convinced that the only way to defeat Modi and his legions is to forge out of the chaos of self-discovery an ambitiously aggressive, confrontationist yet inclusive version of saffron. However, though not a novice anymore, he has miles to go before he leaps and reformulates the new Congress as a new BJP and challenges the Mighty Modi. Yes, maybe he has established himself as a good speaker and for the first time, without confusion. Yet this is not enough to lead the country. He has to tackle Xi Ping who seems to have Hitlerite ambitions (!) and wily Putin, aggressive Trump...et al. Of Pakistan, which can hold together only on anti-India base. Just imagine Rahul sitting in PM's chair and these powerful personalities siting across the table ! Waste of space over a worthless dynast. People have not forgotten the love and affection shown by congress party during 1984 violences and also the killing of a student in Kerala this month.unlike media.
" 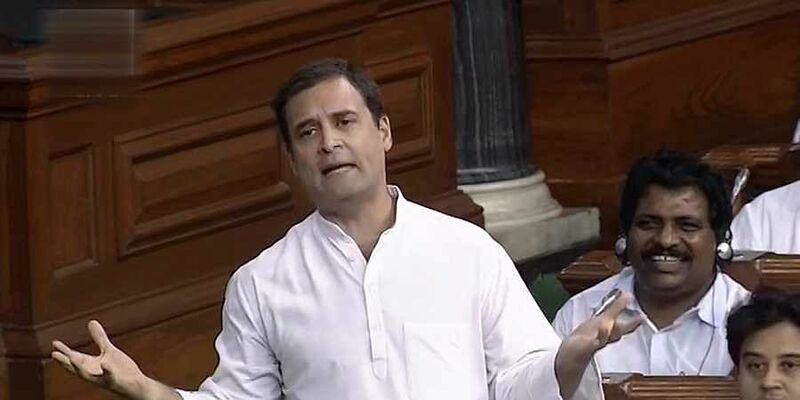 Rahul’s moment came while displaying unexpected oratorical and strategic skills ín the Lok Sabha on July 20 during a no-confidence motion against the Narendra Modi government—the 27th in parliamentary history". Here is 'An Ode to Rabble Rousing' !! Sad day for journalism.